The NBA knows social media drama like no other league. Just this past Friday evening, reports surfaced from ESPN’s Adrian Wojnarowski that the Washington Wizards, Memphis Grizzlies and Phoenix Suns were close to completing a three-team deal. I might be most excited about the fantasy prospects of Mikal Bridges of everyone involved on both rosters. The rookie from Villanova played 40 minutes on Saturday night in an impressive win over the Timberwolves. The addition of Oubre might appear to compromise Bridges’ opportunity rates in a similar fashion to Ariza’s effect on him at times this season, but I think we’ll see Josh Jackson, who logged just 23 minutes and hit 20 percent of his shots against Minnesota, lose opportunity equity in the weeks ahead. There is more fantasy appeal for Rivers, in my opinion, who steps into a backcourt that has been pursuing veteran reinforcements ever since Eric Bledsoe was dealt to Milwaukee last fall. Sadly, this move seems to demote rising rookie De’Anthony Melton, as he’ll likely lose minutes and touches to Rivers in the coming weeks. 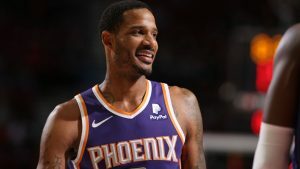 Back to Ariza, he’s an interesting speculative addition, assuming he consumes at least the 26 MPG and 11 shots Oubre had as the team’s sixth man, but with Porter heading for an MRI on his knee on Monday for an injury that has kept him out of the past three games, Ariza’s speculative value is even greater, given context.